Frederic Sischka, who had been a long term polymer chemist at magnetic tape maker Memorex, highly recommended any book on magnetics by Eric D. Daniel. They are now hard to find and expensive, but I located these three in a library. I found these well written, smooth, informative. This documents leans heavily on "Magnetic Recording: The First 100 Years". According to popular rumor, the Germans invented and used magnetic audio recording before and during World War II, which became part of the spoils of war, starting the audio recording industry in the U.S. and elsewhere. This seems a gross oversimplification of fact. The original patents had expired by 1920 and developments were proceeding in Germany, Great Britian, Japan, U.S. and elsewhere. The following extract highlights developments in the U.S. The early tape experiments at Battelle were performed by Gerard Foley. His first attempts at making tape particles were very crude; he collected filings from a material known as Alnico, an aluminum-nickel-cobalt alloy, which was used to make permanent magnets for loudspeakers. These filings were milled to reduce their size and suspended in a lacquer solution. The particle solution was coated on a 0.003-inch-thick cellulose acetate base film, which was chosen because it was easy to coat and bonded well with the lacquer. Since the coating was nonuniform and the particle size had quite a spread, the signal output exhibited large variations (10 dB), poor high-frequency response, and high noise. As the work progressed, Foley tried natural powdered magnetite. While there was some improvement, the variation in particle size was still too great to yield an even coating and produce acceptable performance. Foley then discovered that paint pigments were made from artificially produced magnetite particles, which were also magnetic. Experiments with these particles revealed magnetic and physical properties that were much more consistent than those from the natural magnetites. By mid-1945, using tapes made from the artificial magnetite particles, the total output variations had been reduced from 10 dB to 6 dB and a dynamic range of 35 dB had been achieved. This performance was better than the average wire media and was considered acceptable for Brush's postwar products. Brush did not have experience or facilities to coat tape in the production quantities needed to support its efforts. The company attempted to interest Eastman Kodak, Meade Paper, Minnesota Mining and Manufacturing (3M), and Shellmar (a maker of printed wrappers for bread), which were experienced in large-scale coating techniques. Shellmar, the only company interested in working with Brush to produce tape, entered into an agreement to supply a paper-based magnetite particle tape in production quantities in September 1945. Experimental production was under way by the end of the year, and by spring 1946, Shellmar was supplying relatively large quantities of magnetic particle media for the Mail-A-Voice disk machine and the BK-401 Soundmirror tape recorder. The 3M contact was significant in the development of magnetic tape in the United States because, after the initial discussions with Brush, 3M became interested in magnetic tape and went on to establish a magnetic tape development laboratory. concentrated efforts, better tape particles began to emerge. The ability to product and control particles with acicular, or needlelike, shape was a significant step to ward better quality tapes. The early Brush magnetite particles were basically cubic in structure and were characterized by low coercivity [100-175 oersted (0e)] and retentivity. Low coercivity and retentivity typically limit the high frequency response and dynamic range of the media. The size and shape of acicular oxide particles made it possible to achieve greater particle density and a higher degree of magnetic orientation than could be obtained with the early cubic magnetite particles. This, in turn, resulted in higher coercivities (250-350 Oe) and retentivity, thus providing substantial gains in dynamic range (60 dB was attain able) and high-frequency response. Subsequently, the use of these particles made it possible to reduce the tape speed while maintaining the same performance, resulting in longer playing time per reel. In 1947 3M introduced its first commercial tape (Type 100), which used black oxide acicular particles applied to a paper base. The coercivity was approximately 350 Oe, and the product exhibited increased output and improved high frequency response over the earlier Brush tapes. However, the black oxide tape were difficult to erase because of a memory effect in which residues of earlier recordings could be heard in the background of subsequent recordings. With the introduction of red acicular gamma ferric oxide (y Fe2O3), this memory effect was eliminated. In 1948 3M introduced the first acicular gamma ferric oxide tape (Type 101), coated on a paper base. The coercivity was between 250 and 275 Oe. Type 111, which soon followed, used the same particles but was coated on a new cellulose acetate base. The ubiquitous 111 tape became one of the most widely used tapes for professional applications in the 1950s. By 1956, gamma ferric oxide particles were used on all audio magnetic tape manufactured in this country and were gaining use abroad. With the developments at 3M and by others, Brush was losing its competitive advantage. To stay in the market while improving product performance, Brush continued its alliance with Shellmar to produce the paper-based magnetite tape. However, Brush's strengths were not in chemistry and coating techniques and the firm was overwhelmed by the much larger research capabilities of the expanding tape industry. Brush stopped trying to compete and began buying tape from 3M packaged with the Brush label and, by 1950, was out of the tape business altogether. The expanding use of magnetic recording greatly increased the demand for magnetic recording tape, and more companies were eager to capitalize on the growing markets. By 1956 there were six major U.S. manufacturers of magnetic tape: 3M, Audio Devices, Reeves Soundcraft, Technical Tape Corporation, Ferro Print, and Orr Radio Industries. In 1959 Orr Industries merged with Ampex to form the Ampex Magnetic Tape Division. The magnetic tape field became very competitive, a development that gave rise to rapid technological advances and improvements. The Uniservo I was the first digital magnetic tape recorder designed, in 1951, to be part of a computer system. It was originally designed by the Eckert-Mauchly Company, which was subsequently bought by Remington Rand. The larger company integrated the tape drive into the Remington Rand UNIVAC computer and built a system for input/output for the UNIVAC series. Input was from card or key entry to tape on the Unityper. Then the tape was moved to the Uniservo I tape drive for reading into the tape control section of the UNIVAC at roughly 12 kc/s. Output was written to tape on the Uniservo 1, and the tape was subsequently moved to a tape-to-printer system, the Uniprinter. This means of buffering the slow input/output rates of punched cards, key entry, or printers was typical of large data processing systems through the early 1970s. Later, the lowered cost of solid state buffer memories allowed consolidation of these processes into the main-frame computer system. The Uniservo I was the basis for tape drive development over the next three decades. The basic architecture featured a removable reel of tape, which was mounted and then threaded to a reel on the tape drive. The tape was automatically loaded into the mechanical system for tensioning and moving up to operating velocity across a magnetic head assembly. The operations of writing, reading (both forward and backward), backspacing, spacing/searching forward, and rewind/unload were essentially the same as the operations of tape subsystems today. cut down on tape head wear, the Uniservo I used a plastic tape that ran very slowly between the head and the metal tape! Other architectural aspects included reading backward, overlapped read and write capability (with two tape drives), fixed blocks (720 characters), certified tape with punched holes to identify bad areas, a "sprocket track" to allow for variable density, common read and write circuits for all tape drives, and a small mercury delay line to help buffer the tape data rate to the system. In total, the Uniservo architecture was a very solid, if difficult, design that would not change much until the introduction of large-cache buffers in the late 1970s. ...	With the high accelerations required to get tape up to speed from a dead stop, the vacuum column tape control system was developed by Jim Weidenhammer in the early 1950s and patented in 1962 (Fig. 17-3). It was a unique solution that provided essentially uniform tensions across the tape and allowed the tape to be brought up to full speed in 7.5 ms on the first two systems, and around 1 ms in later ones. The gentle handling enabled the use of the more fragile, but lighter, plastic-backed tape. This was an unbeatable combination for high-performance tape systems and was used from the 1950s through the 1970s. The vacuum columns had sensors along their length that allowed full control of the reel motors. The length of the columns had to allow for the worst-case conditions, where tape could be almost instantaneously reversed in a backspace operation. To contain the worst-case start, stop, and reverse velocity conditions, for velocities in the 100 in./s region, the vacuum column was several feet long. The choice of 7 parallel tracks on the tape required a head capable of recording and reading back all 7 tracks simultaneously. The original design used one head per track to write the data and subsequently read it back. There was already a precedent for a multitrack head in the Uniservo, albeit those tracks were staggered for ease and accuracy of manufacture. At IBM, processes were developed to manufacture 7 in-line tracks across the recording head. 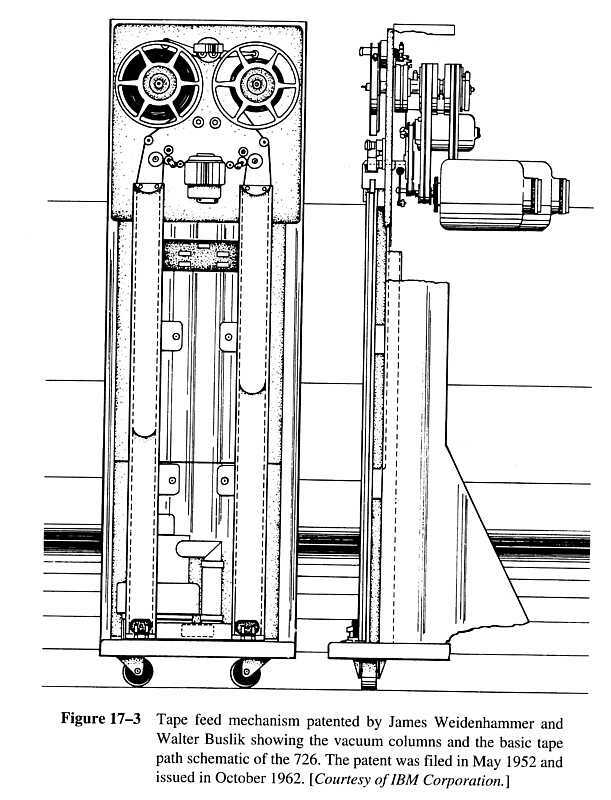 With the vacuum columns providing the tension control, the basic drive mechanism was a symmetrical pair of drive capstans providing a tape velocity of 75 in./s, with the recording head placed approximately midway between the capstans. The tape was pinched between one or the other capstan and an idler driven by a moving coil actuator, biased to the forward or backward direction. The moving coil, magnet, and magnetic circuit were designed to move the idler mechanism into either a drive, neutral, or stop position as fast as possible. The faster the tape could reach terminal velocity, the better the access time and the smaller the inter-record gap. 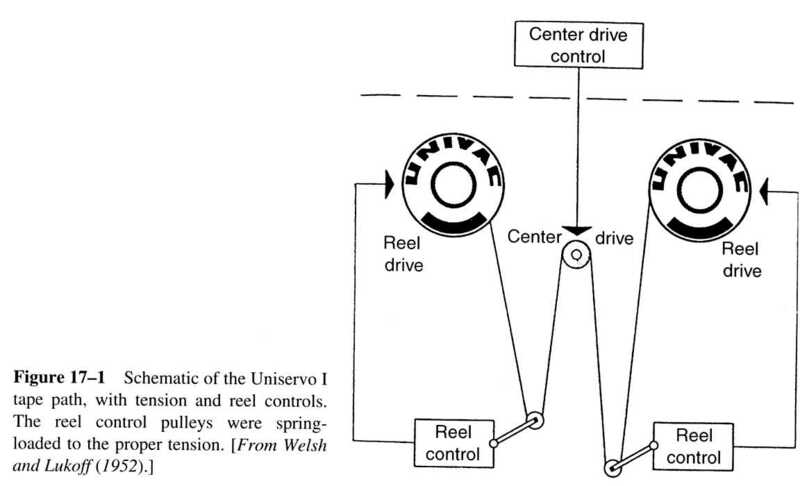 Following the Uniservo design, as much as possible of the common electronics and power went into the control unit, to minimize cost and space. The electronics of the early 1950s was based on vacuum tubes, along with relays, to perform all the logical functions of the tape systems. Later, crystal diodes were used to provide more compact and energy- efficient logic electronics. Nonetheless, the early tape systems used hundreds of vacuum tubes in pluggable units of eight tubes. Early on in the recording system development, all the encoding techniques for digital data had problems. Either there were more transitions per bit of data than needed, lowering the upper limit of the recording data density achievable and reducing the recording margin to perturbations, or there were too few transitions to provide reliable clocking data to keep all 7 tracks in synchronism. Byron Phelps was the project leader of the recording engineering team, and he developed a new code he named NRZI, a form of non-return-to-zero encoding. This code is still used today because it provides a good compromise between the transitions per bit and the data clocking needs. The NRZI code is not self-clocking and requires the recording format to provide some means of clocking data. Thus a complementary track was recorded in the second track of a 2-track parallel system. The second track was recorded with exactly the opposite signal to the data track, so that a "one" was guaranteed in one or the other track, providing the necessary clock bit per character. This limited the data rate to 7500 b/s, or 1250 (6-bit) c/s. While fast compared to the punched card, this data rate was well below the interface speed and the computer data rate. The 2-track system was soon replaced with a 0.5-inch tape drive with 7 tracks in parallel: 6 data tracks plus an odd parity track. The choice of odd parity gave a minimum of one bit per character, satisfying the need for clocking data. The latter was true only if all the bits in a track were read prior to any bits of the subsequent character being read. When bits from other characters were read early, it was mainly because the guiding accuracy of the tape path was inadequate. If the tape "fishtailed" through the head guide system, the linear bit density achievable was reduced. The original IBM 726 and 727 systems using 10.5-inch reels and 0.5-inch tape became de facto standards for commercial and scientific computer systems. Numerous other tape systems emerged, but they used the standard format of these early systems to facilitate tape interchange. Systems manufacturers, including National Cash Register and Control Data Corporation, had tape systems using this format. In addition, equipment manufacturers, including Ampex, Potter, and Mohawk Data Systems, offered tape systems using this format. Other formats were developed, such as the Sperry Rand Uniservo, which had innovative features, but they never became a standard in the industry. The operating characteristics of early IBM tape drives, using 0.5-inch tape and 10.5-inch reels, are listed in Table 17-1.